Bella Grace Vineyard & Wine Cave provides a panoramic viewpoint of our estate vineyard and historic Steiner Road vineyards, backdropped with the High Sierra. It is the perfect setting to relax, picnic and taste award-winning wines, olive oils, and vinegars! Charles Spinetta Winery released its first three premium wines in 1984. Limiting production gives us time to make high quality red wines and luxurious sweet wines that are estate grown, estate bottled, and family made. Welcome to Deaver Vineyards, in the heart of the beautiful Shenandoah Valley of Amador County, where grape growing has been a family tradition for over 150 years. Visit our tasting room daily from 10:30am - 5:00pm, and browse our renowned gift shop for some of the best wine and home accessories you'll find anywhere! Plan to stay and enjoy a picnic lunch by our lovely pond, and don't miss out on our special events throughout the year. Family owned and operated, local presence for five generations, handcrafted, dry farmed, small quantities but high quality, and all at Dillian Wines. Swing by to taste award -winning wines from estate and locally grown old vine vineyards and to learn about the history of wine making in the area from the owner, Tom Dillian, and the wine maker, Thomas Dillian. Dobra Zemlja Winery promises 'Big Amador Reds, No Lightweights' and was founded in 1995 by owners Milan and Victoria Matulich. Meaning 'good earth' in Croatian, Dobra Zemlja (Doh-bra Zem-ya) focuses on wines this area is famous for: Viognier, Sangiovese, Barbera, Syrah and Zinfandel. If you're looking for big, hearty, unfiltered wines and a friendly atmosphere, pack a picnic lunch and man's best friend and come taste in the first wine cave in Amador County! In the fall of 2014, Tom and his wife, Beth Jones, purchased Amador Foothill Winery located in Amador County’s beautiful Shenandoah Valley. Located in one of California’s premier wine regions, Tom was drawn to the opportunity to own and operate his own winery. As he said, “there is no substitution for walking the vineyards, controlling the growing conditions, and most importantly tasting the ripening grapes to determine when they are ideal for harvest. Our new estate affords me control from the vine to the bottle for all of my wines.” They were welcomed by the warm and vibrant Amador community, especially the other wineries on Steiner Road. Experience the tranquil beauty of the Sierra Foothills wine growing region at Rombauer’s Tasting Room in Plymouth, in the heart of Amador County. Surrounded by tall trees and lush landscaping, our Sierra Foothills Tasting Room features spacious indoor and outdoor spaces, including a tasting bar and covered patio, ideal for tasting and picnicking. Stroll the grounds and enjoy a flight of Rombauer wines with our friendly and knowledgeable hosts. You’ll taste locally-sourced and produced Zinfandels from Rombauer’s estate and grower vineyards in the Sierra Foothills, as well as our tried and true favorites from Carneros and Napa Valley. 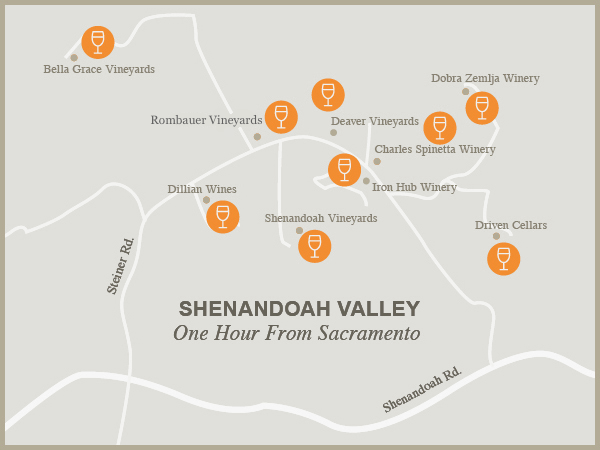 Leon and Shirley Sobon founded Shenandoah Vineyards in 1977. They were one of the first four wineries in Amador County's now well known Shenandoah Valley appellation. From the first offering of 1,200 cases, the winery has continued to thrive, adjusting the portfolio of wines over the years. It is now producing about 25,000 cases per year. Demand continues to grow as a result of skilled winemaking, marketing, and strong family commitments to quality and service. Today, we continue to use estate grown grapes from our sustainably-farmed vineyards.